Laughing Place is a five bedroom beach cottage in Seacrest Village, Southern Shores. It offers basic amenities and might be the perfect place for your next vacation if “being close to the beach” is at the top of your priority list. The main level of the home has vinyl floors and paneled walls throughout. The open living/dining/kitchen area has an eclectic mixture of furniture including a sleep sofa, ceiling fan, WINDOW A/C, baseboard heat, TV, and book library, dining area with table that seats 10, small kitchen with microwave and dishwasher. Laughing Place offers 3 bedrooms in the main house, each with WINDOW A/C unit (master bedroom with Double and bath with shower, 1 with Double, 1 with 2 Bunk sets), hall bath (with tub and shower). Just off the kitchen is a large screened porch with some outdoor furniture and a breezeway leading to a separate bedroom annex. Connected by breezeway the annex also has vinyl floors throughout, but includes central heat and A/C: 2 bedrooms with slider access (each with Twins), bath (tub and shower). 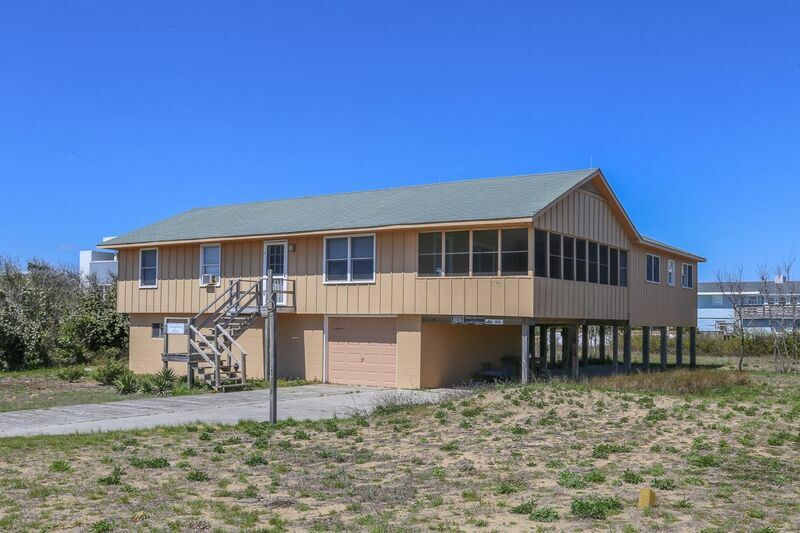 Like most of our Southern Shores rental homes, Laughing Place is in a quiet residential setting, yet is in close proximity to many of the area’s main attractions, such as, Currituck Lighthouse, Wright Brothers’ Memorial, and Jockey’s Ridge State park. Its 9th Avenue location puts you close to the Hillcrest beach access where a stationary lifeguard is on duty in the summer months. And it is only a short bike ride up to the Town of Duck for shopping, watersports, or just enjoying the boardwalk along the Currituck Sound. Laughing Place offers a no-frills vacation to those looking for a place to rest their head at night, while enjoying easy access to the wonderful beaches of the Outer Banks of North Carolina.